We had a fantastic weekend, meeting so many brides to be at the East Meets West Bridal Show held at the excellent Aston Villa Football Park. There were so many different and inspiring exhibitors and the bridal fashion show was so vibrant and absolutely stunning. 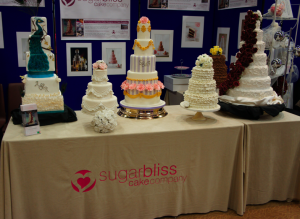 It was wonderful to be showcasing just a few of our new wedding cake designs for 2013 and for the brides & grooms to sample some of our new cake flavours and fillings. Don’t forget to look out in next month’s Your Wedding Cake magazine to see if you are the lucky winner of our wedding cake competition 2013. Some new cake making and decorating products have just arrived at our Cake Decorating shop. One of our favouites is the Sweetly Does It Silicone Cake Pop Mould. This ultra flexible, silicone mould makes baking cake pops a piece of cake! Made from silicone, the mould is non-stick for easy release, as well as heat resistant to 260°C (500°F). and makes twenty perfectly round cake pops. Simply decorate with wilton candy melts and sprinkle some coloured sugars on top. Look out in next month’s Your Wedding Cake magazine to see if you are the lucky winner of our wedding cake competition 2013.